There are four people in her family including her parents, one sister, and her. Her father is the breadwinner and is overwhelmed with financial burden to fulfill the basic needs of his family and school fees of the children. Giang is malnourished at 1st degree. Giang's family is listed as a poor household by the local authority. Her parents don?t have any farmland. Her father earns for living by uprooting trees and replanting for hire. This job can bring him about 7 USD/day; however, work opportunity does not come every day. The income of family is low and not stable. This may lead the child to risk of dropping-out of school. 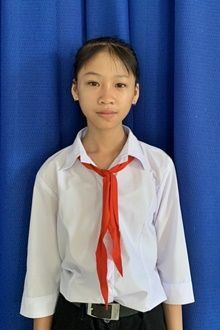 Tell your friends Giang needs a sponsor!